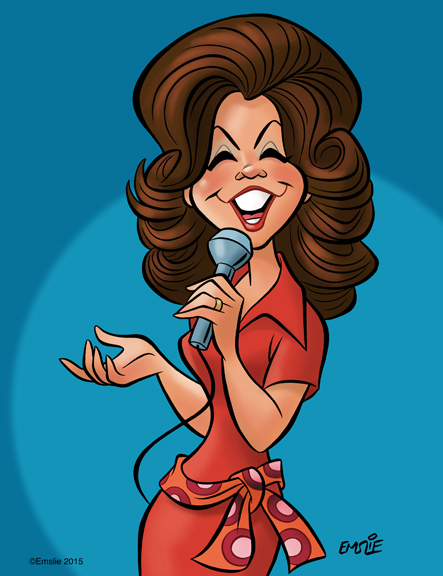 The Cartoon Cave: Happy Birthday, Jody Miller! Nice job on the blog entry and the cartoon! I really enjoyed what you had to say. When Jody contacted Billy Sherrill at Epic Records to work with her in the 70's, his strategy was to bridge the worlds of pop and country to highlight Jody's expertise in both arenas. "He's So Fine" was a heck of a hit for her, crossing over from #5 Country to #2 Easy Listening and even #53 on Billboard Hot 100, which is pretty good considering it was originally only targeted for Country audiences. Jody's version of "He's So Fine" did garner another Grammy nomination for her, so that's pretty good. Jody herself begged Billy Sherrill and company to write original songs for her, which resulted in her Top 10 Country hits for her such as "There's a Party Goin' On" (#2) and "Good News," (#9) as well a Foster and Rice Top 5 Country Hit "Darling, You Can Always Come Back Home." Worth noting is the fact that Jody and Johnny Paycheck were nominated for CMA Duet of the year for Jody's single "Let's All Go Down to the River," her 1972 hit which has become a country gospel standard. Jody also is the only Billboard charting artist of the 70's that I am aware of who commuted from her home in Oklahoma (rather than living in L.A. NYC or Nashville) to record and make appearances. This is a much more common practice today, but in the 70's it was almost unheard of. This proves again how Jody Miller was ahead of her time. Thanks again for recognizing this great artist on her birthday. Your illustration of her is fabulous! Thanks, Jennie! I'm happy to hear that Jody had several hits along the way after all, as I'm admittedly no expert on her career or the Billboard charts, so I wasn't aware. I think she's a terrific talent with such a warm, rich voice, and also she strikes me as being a very classy lady! If you're a big country fan like me, you may be interested in the previous caricatures and tribute posts I've done on here for Crystal Gayle and Jerry Reed. Starting back around the mid 1970s, I pretty much listened to country music exclusively, having been less enamoured with where pop music was starting to head at that time. My intention is to caricature more of the classic country stars from that era of the 60s through 80s that I love, before everything started to go the unfortunate way of pop in the 90s with the "New Country" trend. We've lost so many of the classic stars already, so I'd really like to honour the ones who are still here!